Interviewed: Damijan Kracina, Uroš Weinberger, Tomaž Furlan, Vladimir Leben, Silvo Metelko, Boštjan Novak, Mirč Matek, Miran Pešič, Rok Barborič, Andrej Pezelj, Meta Kastelic, Terrah, Rajko Miladić, Tina Drčar, Mitja Ficko, Luka Drinovec, Nataša Tajnik, Neven Korda, Miha Perne, Jaka Mihelič, Rok Mohar, Edi Dobrilović, Urša Toman, Marko A. Kovačič, Anna Ehrlemark, Goran Medjugorac – Gogi, Matej Bizovičar. Interviewers: Sebastijan Krawczyk and Jadranka Plut (Alkatraz Gallery) and Saša Nabergoj and Simona Žvanut (World of Art). Exhibit-research project The Closing Stop has been going on since 2011 in co-operation with the team of the World of Art (SCCA–Ljubljana), the Alkatraz Gallery, and the creators from ACC Metelkova City. Its intention is to explore the history of Metelkova’s visual scene, and the current visual production of the ACC Metelkova City. Within the 19th Anniversary of the ACC Metelkova City we prepared the Mid-Stop, showing a review of the current state of the visual art production at all its versatile levels with exhibitions, open studios, public speeches and interventions, as well as screenings into the Metelkova public space. 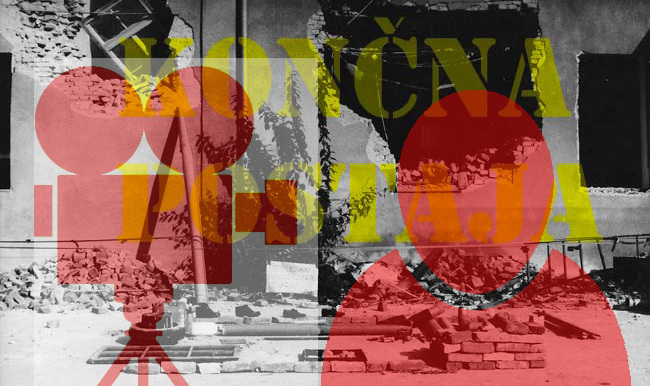 Within the 20th Anniversary we prepared The Closing-Stop which was upgrading the discourse on the Metelkova visual art production with a research into – not only its history – but the historical memory of the entire ACC Metelkova City. We have to point out that we have shot a series of 26 video recordings with artists working at Metelkova, as well as with those whom we have assessed as key ones, but are no longer creating at this venue. We were interested in the history of Metelkova, not particular artistic practices. Personal histories, subjective views, multiplicity of narratives. The video essays wish to preserve the stories of the Metelkova protagonists, who complement, overlap, and also oppose one another. First, the video recordings have been on view only at the SCCA–Ljubljana video archive in the Project Room. Later, on the occasion of the 21st anniversary of the ACC Metelkova City, we have started to upload them on the World of Art web page: every week (since 3 September 2014) one new video recording will be uploaded to finally make accessible all the 26 interviews.